Matt Damon goes little and follows his conscience in Alexander Payne’s biggest film. Director Alexander Payne (Sideways, Nebraska, The Descendants) is known for his satirical, chucklesome depictions of American society, winning Best Screenplay twice and scoring a Best Director nomination three times. He’s not had a misfire yet. Some critics say this changes that, but if it does, it’s a pretty terrific misfire. Downsizing is certainly his most ambitious project to date. An unpredictable journey (two parts social commentary, one part comedy) through a beautifully realised miniature world, even if that world does sink into the background for long stretches. Damon makes for a great everyman, pressured by his selfish wife to downsize only to be left worse off, but finding his place in a global community. The cast is fun, from Hong Chau (Inherent Vice) as a blunt, poorly-spoken Vietnamese refugee to Christoph Waltz as an aging Ukrainian partyboy (complete with dodgy accent). It’s Damon’s message-heavy romantic relationship in the final act that will probably turn some off. What’s meant to be an uplifting outcome doesn’t convincingly solve his emotional loneliness. But Downsizing entertains, provokes and is wonderfully observed and wryly amusing when it’s not being sporadically hilarious. 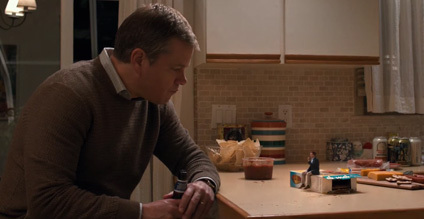 Downsizing is released in the US on December 22nd, and in the UK on January 19th.